The Washington quarter dollar replaced the Standing Liberty quarter in 1932. Since the United States Mint issued the Standing Liberty quarter for less than 25 years, it required an act of Congress to approve the new design. The work was initially commissioned to celebrate the 200th anniversary of the birth of George Washington. John Flanagan, a sculptor from New York, submitted a design that the Treasury Department chose from nearly 100 models presented from a contest. Production was limited in 1932 because of the Great Depression, and the mint did not produce any coins in 1933. Flanagan based the obverse on a sculpture of Washington by Jean-Antoine Houdon. Washington faces left with the word LIBERTY above. The date is along the bottom and the motto IN GOD WE TRUST on two lines to the left of Washington. The reverse depicts an eagle holding a bundle of arrows with two olive branches. UNITED STATES OF AMERICA appears above with the motto E PLURIBUS UNUM. The denomination QUARTER DOLLAR appears at the bottom. The coin was produced from 1932 until 1998 when Congress replaced it with the 50 State Quarters Program in 1999. Initially, the coin was made of 90% silver until 1965 when a law was passed to change the composition to a copper-nickel clad composition. In celebration of the 200th anniversary (Bicentennial) of the signing of The Declaration of Independence, an exclusive design was created for the reverse of the coin. The date on the obverse changed to 1776-1976 to indicate this special occasion. The mint began production of this particular issue in 1975 and continued through 1976. Hence no 1975 dated quarters were produced. Assembling a complete set of Washington quarters by date and mintmark requires a total of 147 coins. There are 83 silver Washington quarters (1932-1964) and 64 clad Washington quarters (1965-1998) needed. 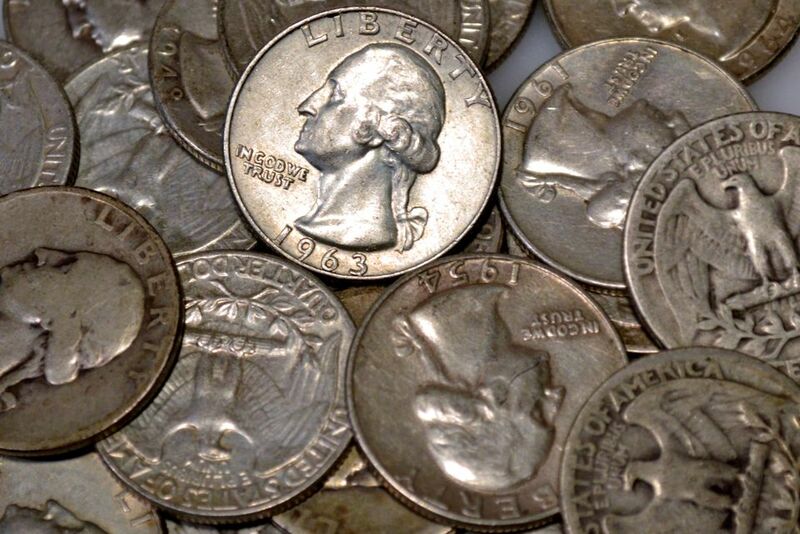 Since People have removed almost all silver Washington quarters from circulation, these coins will have to be purchased through a coin dealer or online. Although there are no extreme rarities, there are a few coins that carry a premium price. The beginning collector should start by assembling a set of circulated Washington clad quarters beginning with the 1965 issue. Most of these can be collected directly from circulation. If you desire uncirculated specimens, most likely you will have to purchase them through a coin dealer. All dates and mint marks are amply available at a minimal cost. The only exceptions are the 1982 and 1983 quarters since the mint did not issue any collector uncirculated mint sets in those years. The intermediate collector will assemble a collection of circulated coins beginning with the 1932 issues. The key dates for a circulated collection are the 1932-D and the 1932-S. These will cost you almost $200 because of their low mintage. The other dates are available at a reasonable price or a small premium above their silver content value. The advanced collector will strive to assemble a complete collection of uncirculated examples beginning with the 1932 coins. However, there are some coins that are quite expensive in uncirculated grades. These include the 1932-D, 1932-S, 1934-D, 1935-D, 1935-S, 1936-D, 1936-S, 1937-D, 1937-S and 1940-D. If the advanced collector is still looking for a challenge, he can also add die varieties and Washington Quarter mint errors to his collection. You'll find that coin dealers have an ample supply of both circulated and uncirculated coins. However, the uncirculated coins listed above may require some searching across several dealers or online to find the date and grade that you are looking for at the price you are willing to pay. Finding clad uncirculated examples that have relatively few bag marks should not be a problem. Look for a good strike and beautiful eye appeal when selecting specimens for your collection. The intermediate and advanced collector will endeavor to find coins that are well struck and have minimal bag marks on them. You can tell if a coin is well struck by looking at the reverse side and inspecting the feathers on the eagle's breast. Additionally, look at the high points on the coin's design for indication of wear. Advanced collectors may also want to add proof issues to their Washington quarter collection. Proof coins were struck beginning in 1936 and continuing through 1942 when production ended because of World War II. Production resumed in 1950 and continued through 1964. Because of the coin shortage in 1965, the United States Mint suspended production of proof coins. To appease collectors, the mint produced special mint strike coins for Special Mint Sets. These special mint sets were issued from 1965 until 1967. Proof production resumed in 1968 and continued through the end of the series in 1998. Many factors go into determining the price and value of a coin. As a coin collector, you must develop your coin grading skills to establish an accurate appraisal of your coins. You should learn how to grade silver Washington quarters (1932-1964), find the values for silver Washington quarters, and clad Washington quarter values (1965-1998). Then you will be able to assemble a collection of Washington quarters that you can be proud of.